If you love the popular cream-filled Easter eggs, you can now make your own at home! These Creme Eggs look like regular chocolate eggs from the outside, but one bite reveals a creamy liquid vanilla filling in the center, complete with a yellow yolk! The secret to getting the filling to liquefy is an ingredient called invertase. Invertase is an enzyme that gradually liquefies sugar, and you can learn more about what it does and where to get it on this invertase page. It can be omitted without affecting the taste, but your centers will have the texture of soft fondant instead of a creamy liquid. Note that you will also need to let these candies sit for at least 5 days to let the invertase work. Combine the water, corn syrup, and sugar in a medium saucepan over medium-high heat. Stir until the sugar dissolves, then cover the pan and allow the sugar syrup to boil for 2 to 3 minutes. Remove the lid, insert a candy thermometer, and continue to cook the syrup, without stirring, until it reaches 240 F (115 C). Pour the fondant into a 9-by-13-inch pan, insert the candy thermometer, and let it cool, undisturbed, until it reaches 120 F (49 C). Using a dampened plastic spatula or wooden spoon, begin to “cream,” or work, the fondant in a figure-8 pattern. Continually scrape the fondant into the center, draw a figure-8, then scrape it together again. At first, the fondant will be very clear and fluid, but it will gradually become more opaque and creamy. After 5 to 10 minutes, the fondant will become very stiff, crumbly, and hard to manipulate. If you would like to see a photo tutorial of this fondant-making process, check out the step-by-step guide to make fondant here. Once the fondant reaches this state, moisten your hands and begin kneading it into a ball like bread dough. As you knead, the fondant will begin to come together and will get softer and smoother. Stop kneading once your fondant is a smooth ball without lumps. At this point, you can pause and wrap the fondant in plastic wrap for several days before continuing with the recipe. Chop the fondant into smaller pieces and place it in a mixing bowl. Add the vanilla extract and the invertase and mix it until the liquids are incorporated. It will be soft and sticky. Take approximately one-quarter of the fondant (about four ounces) and knead in the yellow food coloring until you get a bright, egg yolk color. Roll the yellow fondant into small balls about the size of a dime. You should get about 16 to 18 small yellow balls. Place them on a foil-lined baking sheet and refrigerate them until they are very firm. Once the yellow balls are firm, roll a larger ball of white candy and flatten it in your palm. Place the yellow “yolk” in the center of the egg “white,” and wrap the white around the yellow ball. Form the candy into an egg shape, and place it back on the foil-covered sheet. Once all of your eggs are formed, refrigerate the candy again until it is firm enough to dip. Melt the chocolate candy coating. Using dipping tools or a fork, dip each egg in the coating and place it back on the foil-covered baking sheet. Let the eggs sit at room temperature, then check to make sure they are entirely covered in chocolate. 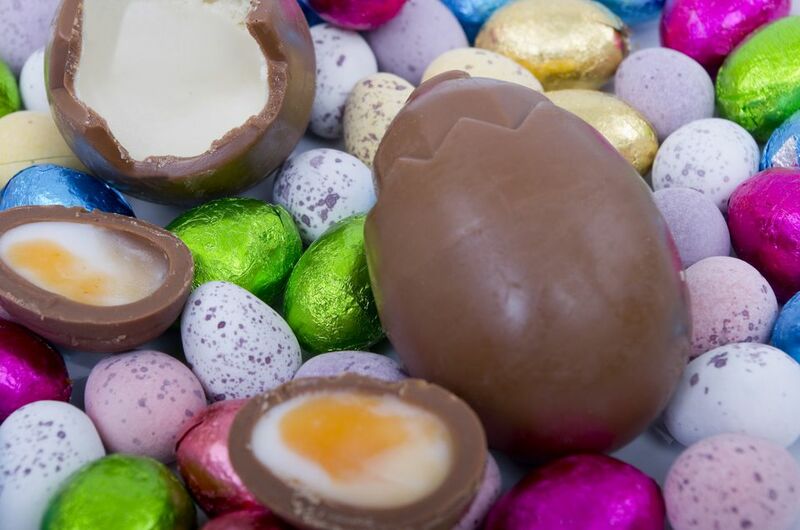 If there are any holes in the coating, the filling might leak through, so make sure to patch up any weak spots or dip the eggs again until they're well-coated with chocolate. Place the eggs in an airtight container, and let them sit at room temperature for at least five days to liquefy the filling. If you can't wait that long, they will still have a great vanilla fondant flavor whenever you choose to eat them!